I was sent two skincare products from InstaNatural and was really excited to try them! (see my other reviews) as they actually worked and was pleasant to use. 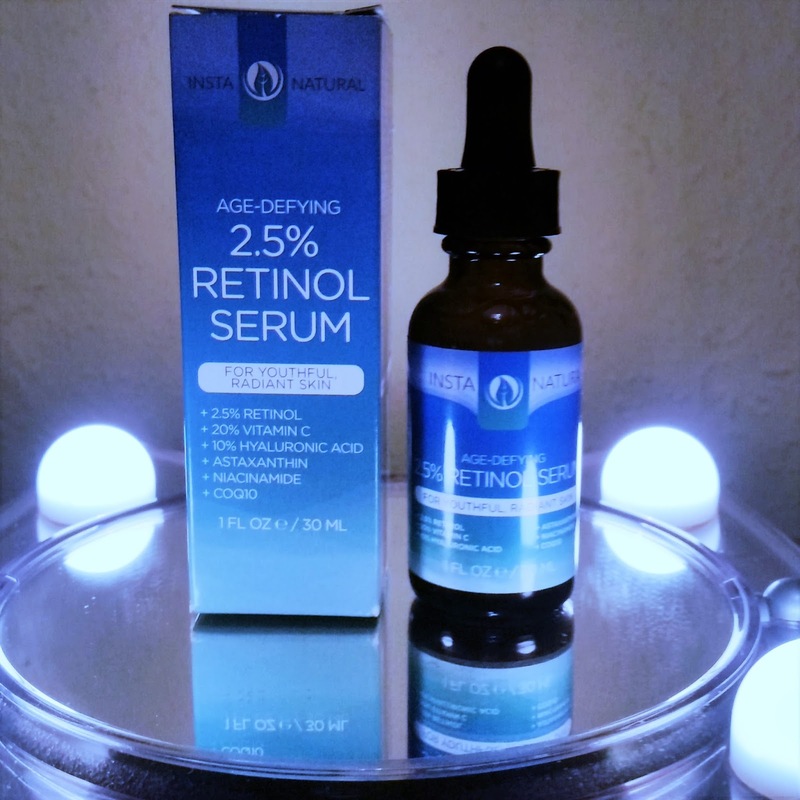 Age Defying 2.5% Retinol serum. I'm always open to trying new products to achieve a healthy glow and overall appearance to my skin. This comes in a 30ml glass brown bottle with a handy dropper top so u can dispense just the right amount on your finger tips to then apply to your skin. and nutrients that nourish your skin to help it look younger and healthier. Wrinkles, Fine Lines, Hyperpigmentation and more. so you can enjoy a more youthful appearance with firmer, plumper skin. Apply a small amount to hands to distribute to face and neck. Allow to dry. Can be worn under make up. For sensitive skin only use at night but for normal to oily skin you can use daytime and night. Remember when using retinol to use a sunscreen as some people become more sensitive to the sun. What surprised me about this serum is the colour and lovely scent. The colour is of a bright orange and the scent smells a really tangy sweet orange. It reminds me of the those soluble vitamin c tablets that you dissolve in water, but better! The serum is of a medium consistency and its quite runny so you only need to use a little to make this serum cover your whole face. I apply one drop to the forehead. cheeks and chin and this is more than enough and is even delicate to use around the eye area. 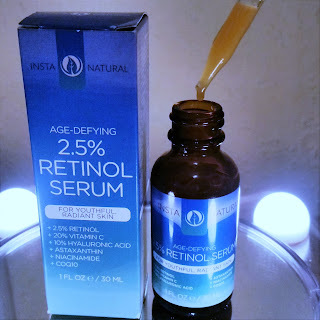 What i really like about this serum is that it absorbs instantly where you have applied, so you are not waiting around clock watching for the product to sink in. You feel this instantly get to work and your skin feels refreshed. I use this only at night followed by the moisturiser and the next morning my skin was looking more healthy with a glowing glow and it appeared i had got more than enough beauty sleep! I had no reactions to using this serum either and i have sensitive skin that gets upset when i use products it hates! Where has this serum been?? I know its staying for sure, in my skincare routine! 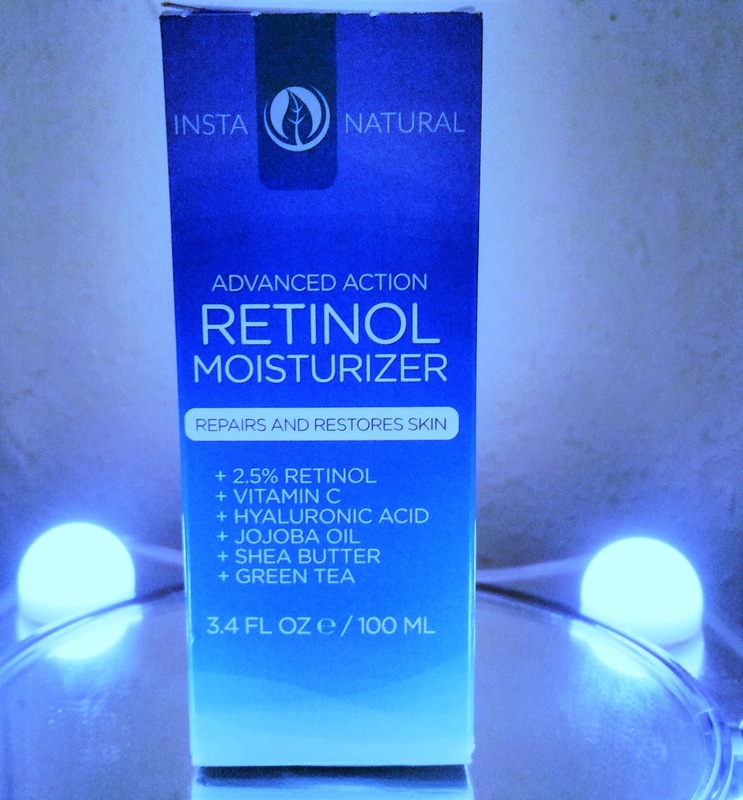 InstaNaturals Retinol Moisturizer contains a robust formula of handpicked ingredients designed to transform older, damaged skin into a healthier and youthful appearance. Retinol is a powerful antioxidant derived from Vitamin A, one of the strongest and most trusted ingredients for anti-ageing skin care. Wrinkles, Fine Lines, Age Spots, Hyperpigmentation, Rough Texture and more. Vitamin C - Another powerful antioxidant - works synergistically to aid in this process of battling early signs of ageing, as well as repairing existing damage to promote healthy looking skin. Shea Butter and Green Tea deliver premium nourishment and hydration to keep your skin moisturised. This intensive moisturising cream is the perfect addition to your regime to restore and renew firmness, elasticity and thickness of the skin for a flawless and radiant complexion. Distribute a small amount of cream on face and neck with your fingertips in a circular and upward motion. Let the cream absorb completely into the skin. For sensitive skin, use only at night. Can be used morning and night if you have normal to oily skin. as Retinol may make your skin more sensitive to the sun. 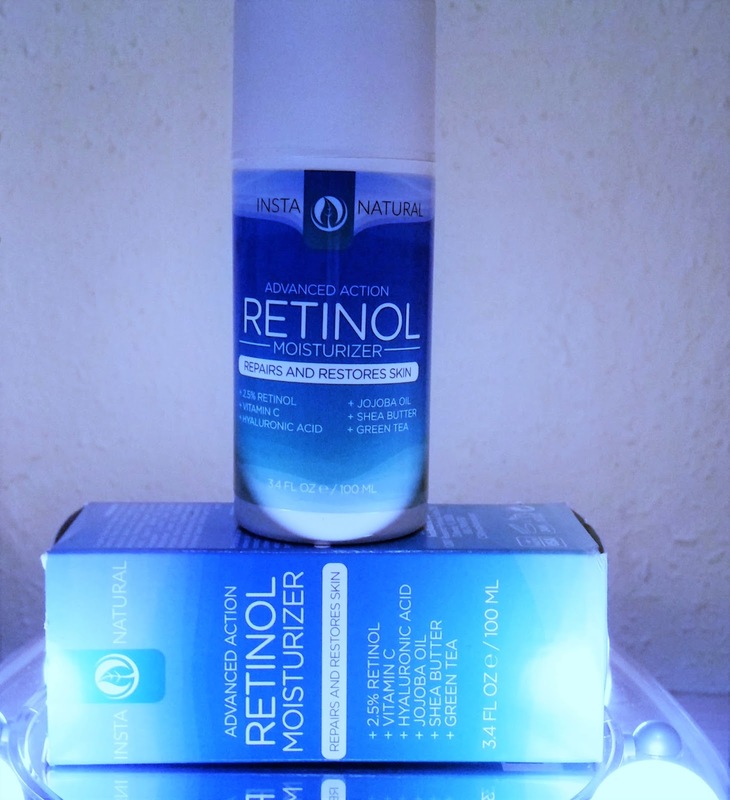 The Retinol Moisturizer is 100 ml with a swivel pump to access the product. The cream is of medium consistency and doesn't really have a scent to it, it smells clean. I apply one pump that covers most of my face but you can use more if suited. This glides onto skin and can easily be moved around with your fingertips. I usually wait around 5 minutes and in that time the moisturiser is absorbed completely without any feeling of stickiness or residue left behind. When i woke the next morning my skin had a healthy glow and it looked more healthier than before i started using this. I do use the serum and moisturiser together and if you do want more moisture you can apply your usual moisturiser over the top. This also didn't take any tan off my face when using the serum and moisturiser together, so you can apply your gradual face tan over these two great products. Every ones skin is different so its what works best for you and your skin. These two products didn't break me out either, my skin drank these two products up and loved them! Remember if you are using any Retinol products during the day to use a HIGH sunscreen!!! 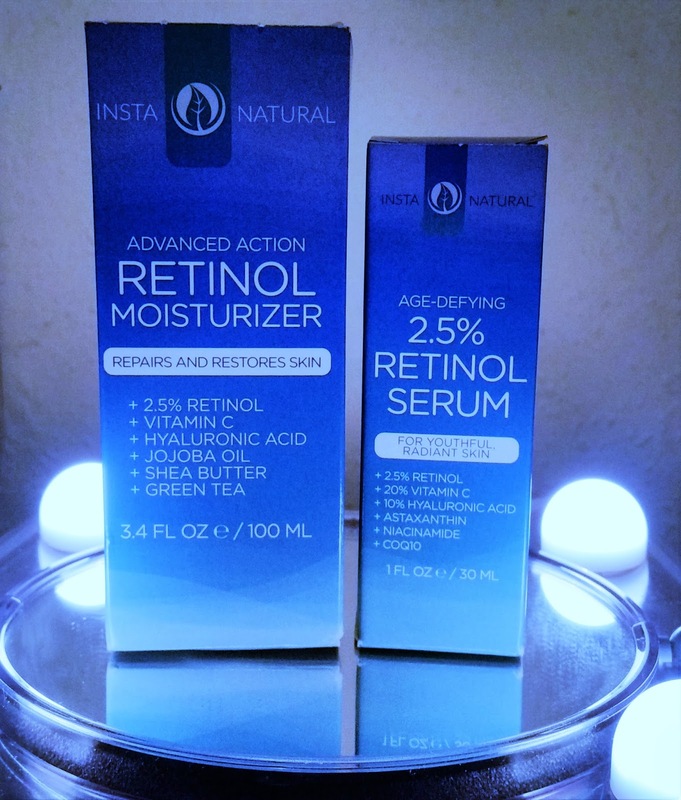 InstaNatural has wowed me again with products that actually work and do what they claim to do! If you interested in these two products you can check them out and purchase on the links provided. X Neal.